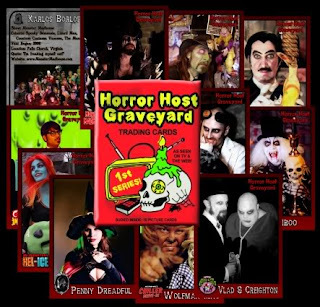 Here's a quick promo for the Horror Host trading card set from Chris Corpse over at horrorhostgraveyard.com - 10 cards for just 5 bucks - you just can't pass that up!! This is volume one - more to come so keep your eyes peeled!! And be sure to swing by horrorhostgraveyard.com every day for a new video and blog entry of a horror host, both classic and new... you'll have more fun than a zombie at a brain buffet! !